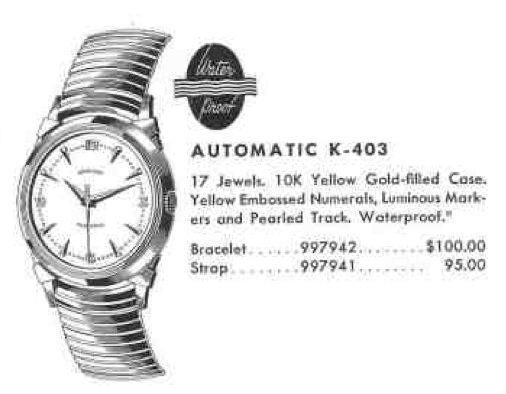 I have what appears to be a K-403 with the same lugs and size, but with a black dial and a different number configuration which includes gold 2,4 8, 10, and 12 Arabic numbers and teardrop hashmarks at the other numbers. There is also a gold dotted track between "Hamilton" at the upper part of the dial and "Automatic" on the lower part and the hour numbers or hashmarks. Was this a manufactured model or is this an altered re-dial? It could be a K-401 or a K-402. They are very similar and the dials are as you describe. The shape of the numbers is important. Or you could have a K-401, K-402 or even K-453 dial in a K-403 case. I found an almost identical (if not identical) watch at a garage sale this weekend. I wound it up, set the time, and walked away for an hour or so. When I came back, it had kept the time perfectly, so I figured it was worth the $15 the seller was asking. It really is the same watch, I think, right down to the lugs. The only difference from yours is the word "AUTOMATIC" which is curved, presumably in the original way. I removed the case back and found that the rotor lifted out without sliding the release toggle. The inside of the case back has many wear lines from the spinning rotor, which I imagine is not how it's supposed to look. If I may ask a question or two, Without seeing this watch in the flesh, so to speak, do you have a theory as to why the rotor was disconnected from the rest of the movement? And do you have a rough idea what an horologist might charge to fix it, assuming the parts (if any are needed) are available? $110-$150 wouldn't be out of line. Of course, I'm sure you could find someone to charge you a lot more. I couldn't tell you why the rotor came off... maybe it's broken or maybe it just came off.